Our organization is engaged in providing high quality Heavy Duty Cranes, which is precision made and find extensive application for the purpose of lifting & transporting the loads of several capacities. 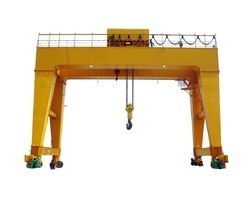 We are the leading manufacturer of Gantry Crane. These are manufactured from latest technology and high grade material to deliver long lasting performance. These are also customized as per the clients requirements. All the national and international safety rules are followed right from the designing part and the crane is designed to work upto 5-6 times the scheduled load.